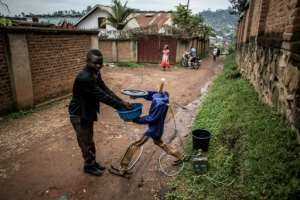 Evelyne was one of the first victims of the Ebola epidemic which broke out in eastern DR Congo last August, the second deadliest in its known history. Against the odds, the nurse not only survived the haemorrhagic virus, whose outbreak has claimed nearly 700 lives, but has also returned to the fray. After receiving a vaccination, Evelyne is now tending Ebola-affected children -- part of a campaign that places social skills at the heart of the effort to roll back the dreaded disease. At an Ebola treatment centre, Evelyne (her name has been changed for the purposes of this story) cradles a seven-month-old baby girl called Sarah. She provides the infant with desperately-needed human contact -- visitors are kept behind protective screens to prevent them from coming into contact with the body fluids of patients who may have the virus. "The first test was negative," Evelyne calls out. "We are waiting for the results of the second." The UN children's agency UNICEF says 30 percent of the 683 deaths registered so far are children or aged under 18 years. Many children are collateral victims, such as Luc, a five-year-old boy playing football with Consolee Katsiwa, a psychologist in a creche run by UNICEF. His mother died of Ebola a day earlier, Katsiwa said. "We are keeping him under observation since he was in direct contact with his mother," she said, adding that he would be monitored for 21 days -- the time taken for the virus to incubate. "If he shows signs of the disease... he could contaminate others in his community." At a school in Butembo, five pupils carefully take notes during an Ebola awareness programme. One of the speakers is Huguette, a 24-year-old woman who was cured after being infected following an Ebola death in January. "I would like to raise awareness among my brothers in Butembo, to tell them that the disease exists, that it is a reality and that it's not stuff that has been invented. "If you don't head for the Ebola treatment centre you will die. But if you go there at the very early stages, you will survive like me," she said. Denial has been costly and bloody. 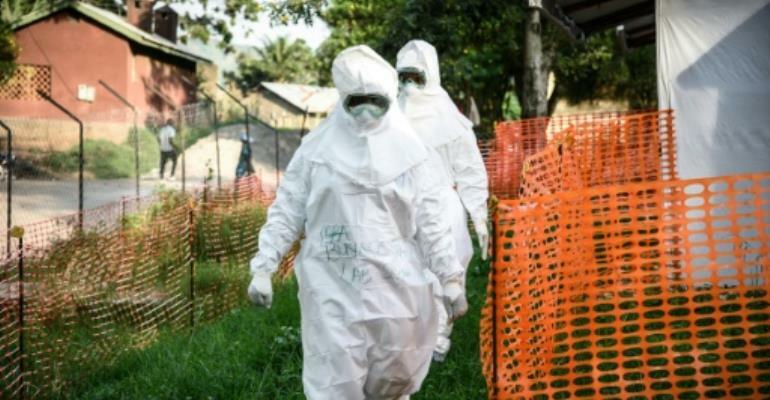 Two Ebola treatment centres in Butembo and the neighbouring town of Katwa were attacked in February and March. A policeman died in the violence. The centre at Katwa reopened last Saturday and authorities are now trying to get locals more involved in the Ebola response drive that many see as being led by foreign aid workers. The health ministry meanwhile said sociologists and anthropologists had called for traditional chiefs to "observe rituals to appease the spirits" before the Katwa centre reopened. "Confidence-building has taken place between the communities and those involved in the response programme in areas where the most violence was recorded," it added. Residents have asked the government and non-governmental organisations to improve the ramshackle infrastructure to provide potable water and better roads. "Ebola instils fear but people understand that it poses a danger and one must protect oneself," said Salome, a woman living near the Katwa centre. 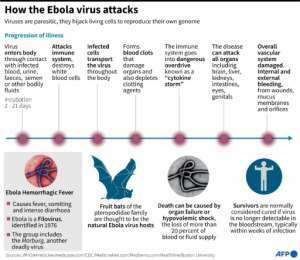 According to the World Health Organization (WHO), the fight against the epidemic could take another six months.